Chicago Rowing Foundation (CRF), a 501(c)(3) not-for-profit organization, was founded in 1998 with a grant from the U.S. Olympic Committee to make sweep rowing (crews of 4 or 8) accessible and available to students throughout the Chicago metropolitan area. CRF boasts a nationally ranked high school program, a growing middle school program, a recreational program for adults, and a nationally ranked adult Masters competitive team. CRF believes the community deserves a whole-person approach to programming. Through our introductory programs, we give new rowers the tools to live a healthier life, and the chance to gain confidence through strength and focus. For the more competitive Junior rowers, CRF coaches take a comprehensive approach to the physical, mental and social well being of their athletes. Rowing is a sport that demands cardiovascular strength, precise teamwork and mental focus, and our coaches cultivate these hardworking athletes into successful individuals and thus, winning teams. Our adult Masters program gives new and experienced rowers the chance to compete, or simply stay on the water for recreation. 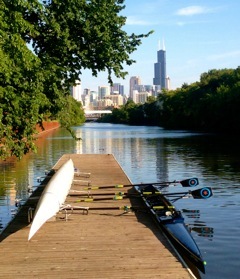 Our home, the Chicago Park District’s WMS Boathouse at Clark Park is the premier rowing center in the city, with year round training and facilities unmatched in the region. Through our partnership with the Chicago Park District, CRF provides low-cost community programs in addition to our existing recreational and competitive teams. Video produced by Leigh Jones, Boomthrift. Nine Varsity Rowers participated in National Signing Day to mark their official commitments to some very impressive schools! Congratulations, rowers, for all your hard work! We're so proud of you! Chicago Rowing Foundation is a proud member of USRowing.